Mo i Rana is the third largest city in Northern Norway, and the largest city along the European route E6 north of Trondheim. The city is situated at the head of Ranfjord, it's just on the southern side of Saltfjellet National Park. The municipality Rana is famous for their numerous caves. Mo i Rana is a new and modern city with many facilities. Downtown is situated at the end of a fjord. The city is an excellent gateway to your arctic vacation in Northern Norway. Relax in the city on a nice hotel. Enjoy a good meal on a restaurant while you plan your vacation. Experience cultural activities like museums, theatre, cinema, marina, and different festivals when you are in town. Mo i Rana's climate is classified subarctic with cold winters, and short warm summers. July and August are the warmest months. Temperature can peak to 30 °C (88 °F) in July, and you can experience 24 hours of daylight and midnight sun through the beautiful arctic summer. The winter in Mo i Rana is long, cold, beautiful and exotic. It's an eldorado for those who like outdoor life. You can experience the Northern Light on the night sky. It varies in intensity, coloured from white green to deep red, and comes in different shapes. Experience skiing and snowboarding in the nearby Alpine Resorts, or go cross country skiing in the great scenery. In 1946 the Norwegian Parliament approved plans for the construction of an Iron mill in Norway. The Parliament selected Mo i Rana, and in 1955 the first steel was produced. 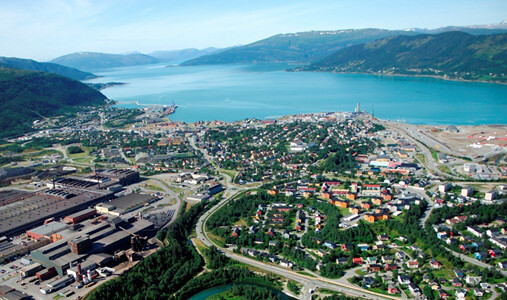 During this period the village of Mo i Rana was changed to an industrial city. People from all over the country moved to Mo i Rana in order to obtain work. The community needed homes for thousands of new residents. Construction of houses and residential blocks started immediately. It was also established electricity and water supply to the city. In 1930, the population was 1300 people. In 1978 The Iron Mill employed approximately 4,500 of the 25,000 town's inhabitants, who is also the current population number of Mo i Rana. The Norwegian Parliament resolved in 1988 to phase out state ownership of the company. Today there are 119 industrial companies at the industrial estate. The companies have activity in the iron and steel industry, the engineering industry, the research and development service industry and the information technology industry. Mining, building boats, and hunting/fishing used to be the main ways of life in Mo i Rana before the Iron mill was built. Starting summer of 1730, there was a Sámi market in town, and wholesale merchant L.A. Meyer started a trade center. The residents traded flour, tobacco, fish, reindeer meat, skins and and other items. They also traded with Sweden in the west.